Relief From Depression Starts Today! To begin, if you’re reading this, then it's likely that you or someone you care about is suffering from depression. And unless you have suffered from depression, it's very hard to appreciate the depth of pain and despair that it can cause. Often those who suffer from depression are told by well meaning friends to “Pull yourself up” or “Just get over it”. If it were only that simple, depression would not be such a difficult and seemingly hopeless condition. If you have depression, then you have probably already tried multiple antidepressant medications, therapy, and perhaps even more aggressive treatment like Electro Convulsant Therapy (ECT). Yet, despite all of your best efforts, you probably didn't get as much relief as you wanted. Unfortunately, while therapy and medications and even ECT can help some people, only about 30% of people with depression will recover with these approaches. Read "Olive's View of Heaven"
Ketamine has long been shown to be rapidly effective in the treatment of depression with relief that can begin within minutes to hours after the first infusion. This may be due to it remarkable effective to block a specific brain chemical and to “reboot” the brain. One of the factor known to contribute to depression is the neurotransmitter known as “glutamate”. It has been implicated in the development and progression of depression by "disconnecting" important brain networks and disrupting communication. It's like someone has "turned off" all of the light switches in a big house and now it is dark and gloomy. The RESTORE Infusion with ketamine effectively blocks glutamate at the receptor site (that little switch which triggers the reaction) in the brain and rapidly "reconnects" the system and turns the lights back on. "Just a few words to let you know that since my treatment in November, I feel better than ever. My mood is stable, I sleep well, and every symptoms of depression disappeared. I almost call this a miracle. My psychiatrist has started to decrease my meds, and everything is fine so far. I finally enjoy life as before, for the first time since at least two years. Everybody around me notice and tell me that I look fine, from my friends to my employees and patients at my clinic. I guess if my cats could talk, they would also tell me I look better. I celebrate my 40th birthday tomorrow, in Carthagena, Colombia. I'll celebrate thinking about what you and Restore have been able to do for me! Best regards, and thanks again." 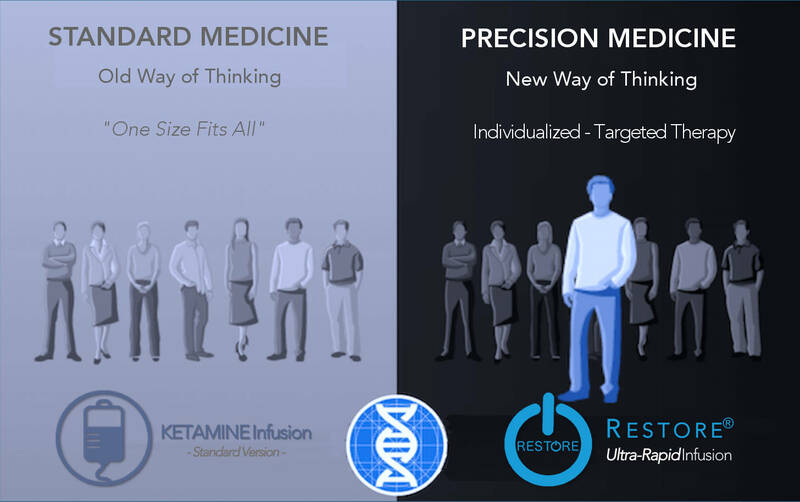 The RESTORE Ultra-Rapid Infusion is the most advanced formulation of ketamine therapy available today and is clinically proven to provide rapid relief and remission from severe depression. Better than that, RESTORE is 3X more effective and relief can last 3 times longer than other with ketamine infusions. Best of all, you can begin to have relief in just minutes after the very first infusion. If you've suffered with depression and almost given up hope of finding relief, now there is hope! It almost sounds too good to be true, but the number of people receiving RESTORE is growing rapidly. Today, almost 18 years after the breakthrough discovery, RESTORE is finally reaching the people who need it most. 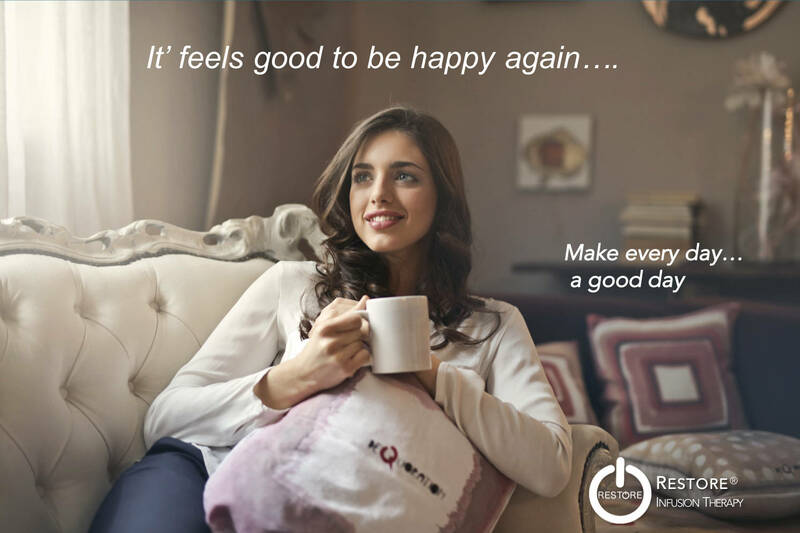 Reboot your life with....RESTORE - The "Gold Standard"
Is RESTORE Ultra-Rapid Infusion right for me? The best chance for rapid relief from the most advanced and effective treatment for depression available. RESTORE Ultra-Rapid Infusion therapy is more effective and longer lasting than other ketamine infusions, so you have the best chances of getting better. 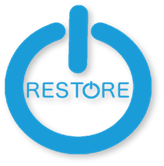 If you suffer from chronic pain or depression and have not had relief with prescription medication or other traditional treatment modalities, then the RESTORE may be an option for you. With the RESTORE Ultra-Rapid Infusion, improvement can be seen within just hours and you only need 3 infusions over just 3 days. So you can begin treatment on Friday and be back at home on Sunday. The fact that RESTORE is longer lasting than other infusions means that you only need 1 or 2 infusions per year to keep feeling better all year long. And RESTORE is individually formulated and customized to your unique circumstances and conditions so you know that you will receive the best possible treatment that’s right for you. Not everyone needs the RESTORE Ultra-Rapid Infusion and many certainly do well enough with the 6 standard infusions and monthly booster infusions. However, if time does not allow for lengthy treatment and monthly follow up infusions or your condition is long standing, severe or complicated then you may benefit the most from RESTORE. We would be happy to answer any of your questions about RESTORE. 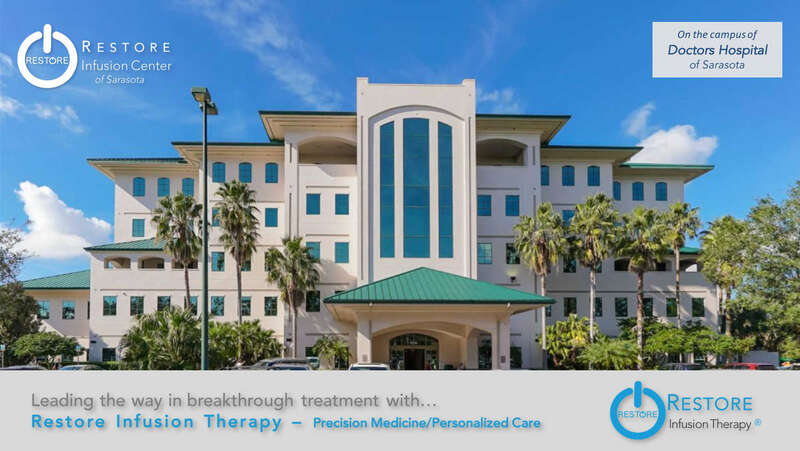 We are happy to provide you with an initial evaluation to see if RESTORE Ultra-Rapid Infusion therapy is right for you. Just call us today!